Thermal imaging or infrared thermography is a nondestructive maintenance method that uses infrared cameras to measure the amount of thermal radiation emitted by objects, which is converted to temperature. Normally, to measure the temperature of objects near room temperature requires the detection of radiation in the infrared wavelength range (which is much longer than that of visible light, i.e., approximately 400–700 nanometers). Infrared images are normally colorized so that objects that emit more thermal radiation than others will appear as brighter colors (yellow, red, and white). Cooler objects appear in darker blue, purple, or green colors. Although thermal imaging normally detects only surface temperatures, infrared signatures often indicate temperatures inside structures. Thermal imaging technology is relatively inexpensive, with cameras typically ranging in cost from $4,000 to $8,000, with some under $2,000 and others over $20,000. Other advantages include fast response (in milliseconds), large capacity for data collection and storage, and the ability to measure moving objects. Certain capabilities such as high-resolution imaging, on-screen prompts, and route mapping increase the price of thermal imaging cameras. Most infrared (IR) inspection cameras are of the long-wavelength type (8–12 micrometers). The capabilities of cameras for heat loss inspection and predictive maintenance are very similar, according to Frank Vallese, President, Electrophysics, A Group Sofradir Company. One slight difference is that some heat loss inspection cameras feature a wide-angle lens that enables the thermographer to view otherwise large objects from a relatively close distance. Predictive maintenance cameras do not normally offer such a feature. On the other hand, predictive maintenance cameras normally are used to measure wider temperature ranges, for example, 0°C–500°C. Heat loss inspection cameras normally have a very narrow temperature range requirement. Cameras continue to improve in capabilities and portability. They can weigh less than 5 lbs and can differentiate between fractions of a degree on surfaces over 20' away. They can store hundreds of images and record audio notes. One manufacturer offers technology that integrates infrared and visual images in full screen or picture-in-picture views for inspections and reports. Another camera comes with optional 2X and wide-angle lenses. Other new features include a laser pointer that aligns with a spot on the thermal image. “This enables the thermographer to point the laser at an object and accurately read its temperature,” says Vallese. Some cameras now come with touchscreen displays to make data entry easier, in-camera routes that provide the thermographer with an equipment list to follow, and in-camera troubleshooting based on equipment types. Software for thermal imaging also continues to advance. Multiple temperature data points within one image are now possible, as well as overlay of isotherm palettes to highlight bands of temperature. Correction factors are also provided for surface emissivity and reflected background temperature. In addition, color palettes can be easily changed and results displayed in a variety of formats. One program can record real-time data complete with 48 temperature measurement zones. Although equipment has become easier to use, a trained and/or certified thermographer is still required to accurately interpret infrared scans. The thermographer is also trained to know how the properties of materials and other factors affect the characteristics of materials they scan. The American Society for Nondestructive Testing (ASNT) provides training to become certified in thermal testing and has also published a handbook on this method. “Properly trained and qualified IR technicians provide companies with a great return on their investment and, importantly, avoid the significant damages often associated with unqualified work,” Vallese says. The Snell Group offers training, certification, inspection, and consulting services for thermal imaging. Thermal imaging is successfully used by commercial roofing inspectors to identify leaks, defects, moisture, and mold on flat and low-slope roofs. Wet areas generate more radiation than dry areas. For proper on-roof inspection, several people are needed: an experienced thermographer and assistant; an experienced roof consultant or roofer; and the building owners’ representative for access and security. Weather conditions must be dry with low winds and no rain. The effects of solar heating must be considered sometimes causing scans to be performed after sundown, for example. After a suspected area is detected and confirmed by the roof consultant, the problem area is highlighted with marking paint. A closer visual inspection will usually determine the exact problem, although sometimes a destructive test is still needed. On-roof inspections are limited to small areas (around 12 sq. ft.) and can be labor intensive. For scanning larger areas (800 sq. ft.) of roof, aerial thermal imaging is one solution and usually only requires a flight crew of two. Scanning is fast (five minutes per 200,000 sq. ft.) and many roofs can be surveyed in one night, as long as weather conditions permit. Imaging is more accurate because plan view visual photographs and infrared thermographs are combined to produce CAD drawings of the wet areas. Although high-resolution, large-format infrared cameras are required, they can detect problems on even highly reflective roofs. Trending of roof moisture also becomes possible. Instead of replacing the entire roof, spot repairs can be made to stop any leaks. The inspector can also verify that any leaks in the roof were repaired successfully, by comparing images taken before and after the repair. With proper roof maintenance, lifespan of roofs can be increased by as much as 300%. Thermal imaging is also an ideal inspection method for predictive maintenance of electrical systems, including motors, drives, electrical boxes, and distribution system junctions. The facility and equipment can remain operational throughout the process. This method can identify whether the problem is a loose connection, corroded element, or a short or overloaded circuit. Over time, electrical connections can become dirty or oxidized, generating excess heat. This can lead to major damage from melting metal or fire. Inspections, such as busway-joint analysis, can be conducted from a safe distance. 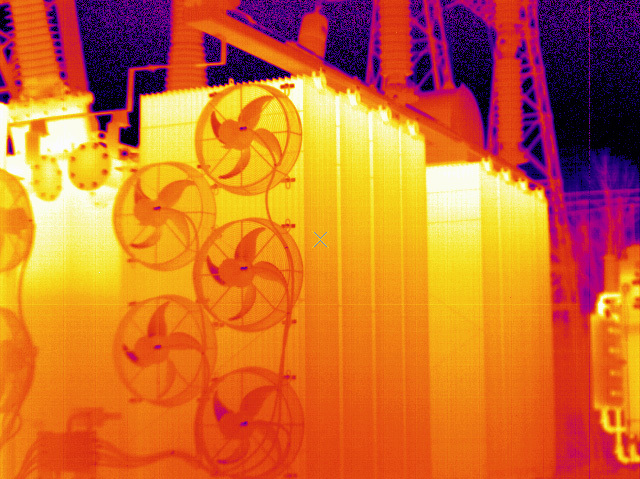 In transmission and distribution systems, thermographic surveys can help to cut production losses and to prevent the failure of these systems. 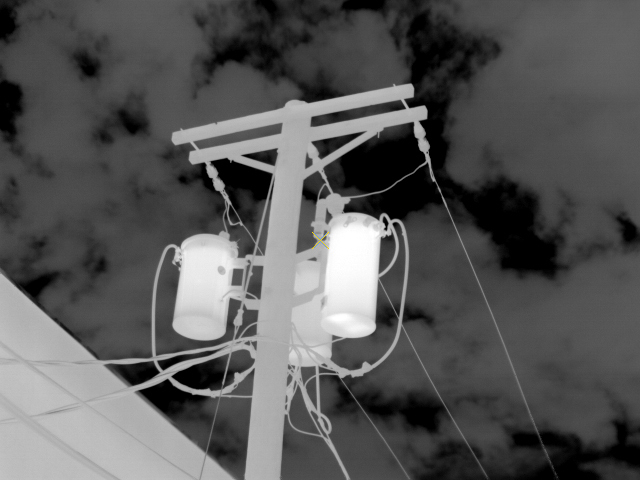 Thermal imaging is also used to inspect utility power poles, allowing technicians to remain a safe distance from the area. 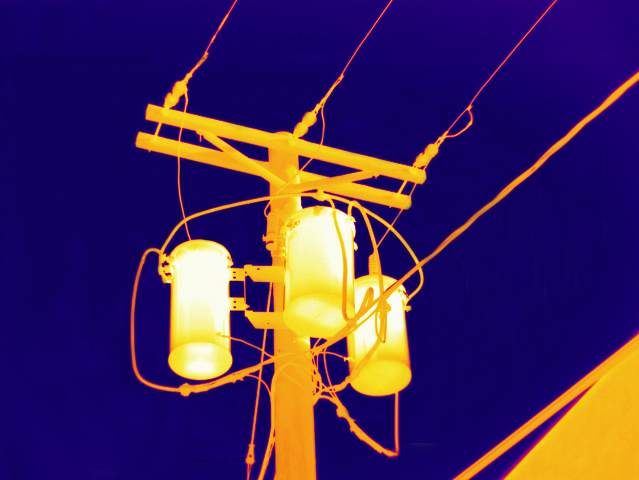 Although aerial thermography can be used for inspecting high-voltage transmission lines (in combination with a ground verification team), it may not be suitable for inspecting distribution lines because they can be obstructed by trees, street lights, and other objects. Thermographers who inspect electrical equipment must follow the National Fire Protection Association’s (NFPA) 70E Standard for Electrical Safety in the Workplace, which mandates wearing arc-flash-rated personal protective equipment as well as a face shield. Arc-flash events can occur when the panel is opened to scan the equipment inside. Because this protective equipment minimizes the ability to see a screen, lenses are available to improve viewing. If the panel remains closed, scanning must be conducted through a special infrared window (acrylic covers are completely opaque to an infrared camera and may have to be removed). This allows thermal imaging to be performed more frequently without changing the state of the equipment. However, written procedures for obtaining accurate results are required. The American Society for Testing and Materials (ASTM) has developed standards for thermal imaging of electrical and mechanical equipment (ASTM E1934-99a). When inspecting electrical equipment, it is important to remember that a hot spot may not indicate a problem. Sometimes a hot spot is just a reflection from another surface and will follow a sight line. An actual hot spot will remain in a fixed location. The loads must be measured by trained and qualified technicians to confirm a problem. Determining inspection frequency can be tricky, Vallese points out. “For electrical equipment, it is best to inspect critical units as frequently as practical, perhaps less critical units less frequently,” he says. 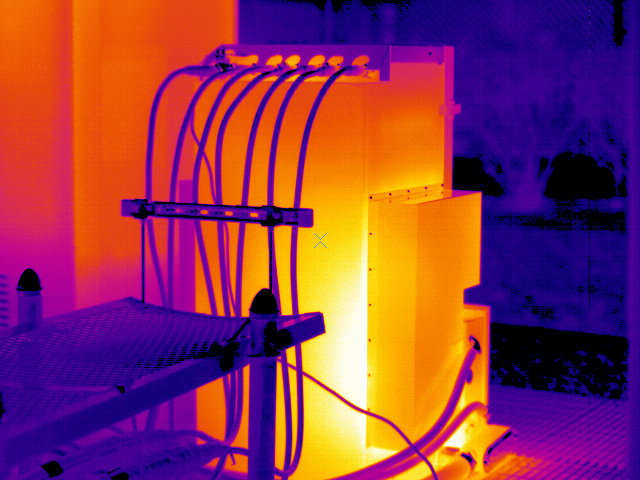 If the thermographer notices unusual trends in thermal patterns, inspection frequency should be increased. Certainly inspection is recommended when new work is performed and important system changes are made.